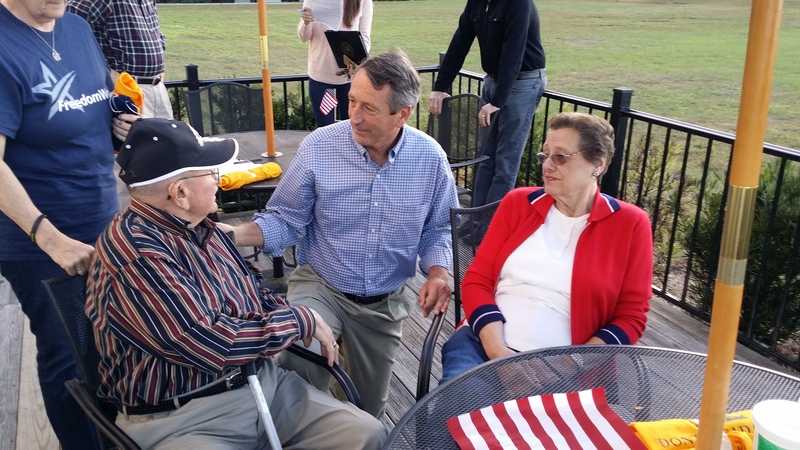 On Friday, November 13, FreedomWorks Southeastern Regional Coordinator Allen Page and other Tea Party grassroots activists from the Low Country in South Carolina met with Representative Mark Sanford (S.C.-1) at Subway in Bluffton, South Carolina to thank him for his courage as an active member of the House Freedom Caucus. The activists told Rep. Sanford they were grateful for his work to fire and replace Rep. John Boehner (Ohio-8) as Speaker of the House. Who would have thought last June that we would have a new Speaker that appears willing to listen to all the House members? Additionally, they told the Congressman how grateful they are for his refreshing willingness to meet face to face and dialog with his constituents, either as individuals or in groups of any size. Rep. Sanford expressed his gratitude for the consistent support that he has received from the grassroots as well as from FreedomWorks. He said we were true patriots for the work we have been doing and that each of us contributing in our own way was the reason we are starting to make progress in Congress. The Congressman noted that when things are challenging in Washington, it meant so much to him to hear from and receive encouragement from grassroots activists in his district. He encouraged everyone to stay engaged in the fight and not give up, as we are having a positive impact. He said further that although the Freedom Caucus members were not the majority in the House, they were having an impact on the political scene in the House and that they will not give up. Several times during our meeting he indicated his deep heartfelt appreciation for our consistent continuing support. Tags Rep. Mark Sanford, Bluffton, S.C., Low Country, south carolina, Bluffton Tea Party, Rep. John Boenher, FreedomWorks Activists, Washington, washington D.C.